Weibull distribution calculator, formulas & example work with steps to estimate the reliability or failure rate or life-time testing of component or product by using the probability density function (pdf) in the statistcal experiments. 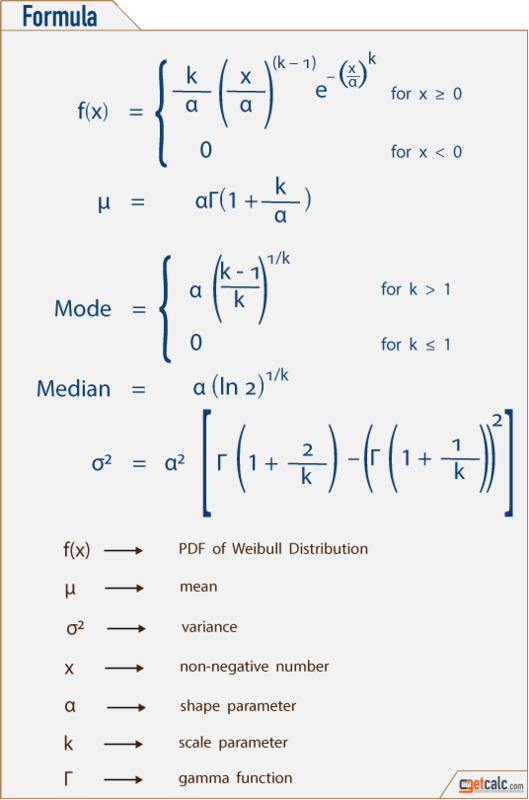 By using this calculator, users may find the failure rate probability P(x), expected life-time or mean (μ), variance (σ2), median and mode values of Weibull probability distribution. This Weibull calculator is featured to generate the work with steps for any corresponding input values to help beginners to learn how the input values are being used in such calculations. The below are the important notes to remember to supply the corresponding input values for this probability density function weibull distribution calculator. The random variable x is the non-negative number value which must be greater than or equal to 0. The weibull distribution is evaluated at this random value x. The scale parameter of the distribution α is a number which must be greater than 0. The shape parameter of the distribution k is a number which must be greater than 0. For inverse weibull distribution, P(x) is probability density function form which must be between 0 and 1 which generally represented by 0 ≤ x ≤ 1. Weibull distribution is an important probability & statistics function to analyze the life-time or reliability of components or products before failure under certain experimental condition. It's a continuous probabilty distribution function, generally used in failure or survival analysis in manufacturing, industrial engineering, electronic equipments, mechanical devices, etc. to predict the length of life or proper functionality of a product from a specified time until it fails. Scaling factor (a), shaping factor (k) & location factor (x) are the input parameters of Weibull distribution which characterize the durability or deterioration of quality of product over time. The P(x) represents the probability of failure rate, mean (μ) represents the expected durability of product & σ2 represents the failure rate variation among the group of products. This probability density function showcase wide variety of forms based on the selection of shape & scaling parameters. Gamma function is the integral part of Weibull distribution to find the expected lifetime & its variance before it failures. The below formula is mathematical representation for probability density function (pdf) of Weibull distribution may help users to know what are all the input parameters are being used in such calculations to determine the reliability of different products & services. Users may use this formula for manual calculations and use this calculator to verify the results of manual calculations or generate complete work with steps. The below are some of the solved examples with solutions for Weibull probability distribution to help users to know how estimate the probabilty of failure of products & services.